Professional African musical instruments are beautifully crafted objects; made from carefully selected materials and precisely formed and tuned to resonate clearly. Take a look at these pages for tips and tricks to keep your instrument in good condition over time. You can also find advice about re-skinning or retuning your instruments, caring for the wood, rope and leather materials they are made from, and most essentially; caring for your own health whilst playing. You can also find instructions here about repairs to worn or damaged instruments. Ghana goods can provide a re-skinning and repair service for instruments on request. Thy body is a temple, don’t hit your drum, but play it. Hands. Hitting will only sound like hitting. 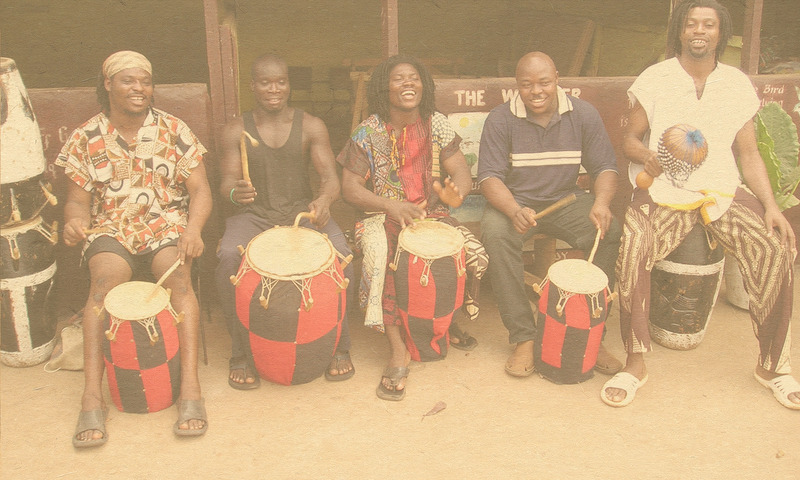 The hand drum strokes are quite precise and designed to let the drum speak in different ways. The bass is a relaxed bounce in the middle of the drum. The tone is a firm hand on the rim of the drum mainly from the elbow. While the slap is a flick of the wrist, throwing the fingers forward to bounce off or squeeze the skin. If your not used to playing its always best to be gentle , learning each stroke on its own and slowly putting them together. Experienced plays with tough skin my strike the drum hard to produce a particular note, but if your not experienced just practice the different techniques and build them up slowly. Bruising and bleeding is not good – change your teacher! If the drum is new you should be able to gently tap the pegs in with a mallet. Traditionally rope has been made from, animal skin, and other natural fibres. All musical instruments should be kept in a dry room away from any direct heat – sun light / radiators. A little sandpaper and teak oil makes most drums sparkle. Do not worry about a crack. A well glued crack, with a good wood glue should be as good as new. There are two knots you need to know when playing the xylophone. To the ends. How the keys are tied to the frame. There is a slit in the upright of the frame into which you will tie the rope. Hold the rope and pass it completely around the upright. On the second time around the rope should go into the slot holding the first time around above it. On the second time around when you meet the rope from the key go over and under through the hole and pull sharp. The end is then wrapped in figures of eight around the frame. To the Keys. When tying the rope around the keys. Start with the note sitting on the frame. You are coming at the not from one side and going to the other. To do this you go over it, under it, and over it again. On the second time over it you go around the original rope twice. And that is it off to the next key. Ideally the keys would be floating just above the frame in mid air, so that the key can vibrate well. If the keys are lying flat on the frame then they will be less resonant. But if the keys are in mid air but far from the frame then they will not be close enough to the gourd so again will be less resonant. I find that it’s often a bit of a compromise, stretching the keys over the frame and then with gravity and time they will always come down, then you stretch them again. A rattle or crack can be produced when the leather that the notes are resting on is old, warn or absent. In this has the wood of the note is touching the wood of the frame. Not good. Replace or retie the leather in place. Another problem could be that the wooden sticks holding the gourds in place are not secure themselves. If you can move them then they are not tight enough. To sort, with thin string or garden rope, wrap them tightly with figures of eight going up and down the xylophone. These jobs are to be done with the keys off. If the notes are touching the sound would be bad. Just gently pull them away from each other. If the come back together, dampen the rope leave for 10 minutes and do the same thing again. The note could also have a crack a fault which would have to be replaced. The not also may have a wood worm hole with a grain of something inside rattling. If this is the case it would mean taking the note off and putting the hole so the entrance is to the floor and playing it, shaking it out. The xylophones are constructed from a wooden frame. The frame is held together strips of wet cow/goat skin which dries and shrinks around the frame. Sticks are tied across the top of the frame between which the gourds are hung. A strip of goatskin is tied from end to end on top of the frame for the notes to rest on. The notes are tied together/strung with antelope rope or nylon/polyester rope.